Use this San Diego Hotels Search Form to find hotels in San Diego. Welcome to San Diego Hotel Deals. We offer hotel, resort and lodging services at over 200 Hotels in and around San Diego and surrounding areas including: Hotel Circle, Downtown San Diego, Gas Lamp District, LegoLand, The Zoo and many more. We offer the most comprehensive listing of San Diego Hotel Deals with great rates, photos, maps, and hotel descriptions. 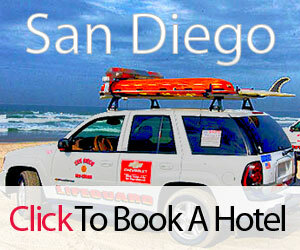 San Diego Hotel Deals is your one source for the guaranteed lowest rates on all San Diego Hotels and accommodations. Hotels listed on San Diego Hotel Deals have been reviewed by previous guests. The individual guest reviews are available on our hotel booking pages and viewable once you pick a hotel to research. Our partner hotels typically offer great discounts off their lowest published rates, saving you money. Let San Diego Hotel Deals be your guide to the San Diego area. We hope you enjoy your stay! Should you need off-line reservation help or customer service, please call: 1-800-509-9025 and mention promo code: 24490. San Diego is your destination for fun in the sun. San Diego is famous for it's many beaches and close proximity to different outdoor regions. Stay to the west and enjoy the beaches, go north and you'll quickly be in the mountains, take a jaunt to the east and you'll find the desert. San Diego is also known fo it's downtown and Gas Lamp district. You'll find great restaurants and nightclubs. We have great group rates of meetings and conventions in San Diego. Let us negotiate with San Diego Hotel and Resorts for just the right meeting room and discount rates for your next San Diego business meeting. With the San Diego Chargers (NFL) and the San Diego Padres (MLB), sports fans will find plenty to do in San Diego. In addition to watching sports, there are many activities tourists can participate in as well. For an experience you won't soon forget, don't miss the Fourth of July Fireworks over San Diego Bay. As a beach community, San Diego is very popular in the summer months. Mission Bay, Pacific Beach, La Jolla and other areas are full of beach lovers from around the Southwest. With San Diego's great weather, San Diego is also a very popular convention destination. Hundreds of smaller and citywide conventions are held in San Diego annually. Since San Diego is on the border with Mexico, many Mexican celebrations take place in San Diego each year. Cinco de Mayo is one huge San Diego fiesta. As a major tourist destination, San Diego has many wonderful attractions. First, San Diego SeaWorld, home to Shamu, is fun for the whole family. Also, don't miss the world famous San Diego Zoo. Just north of San Diego is an adventure for the little ones in your family - Legoland. Since San Diego is a popular beach destination, be sure and visit one San Diego’s many beaches including: La Jolla beach, Coronado beach, Pacific beach or Mission Bay for the little ones still afraid of big waves. Hiking, biking and other outdoor attractions. ...Check out attractions in and around the San Diego area.